WASHINGTON CITY – A sprinkle head burst in the council chambers of the Washington City Hall on Wednesday afternoon and affected city phone lines leading to a very short City Council meeting. The Washington City Fire Department was alerted to a fire alarm at City Hall around 2:40 p.m., when sensors detected low water pressure in the sprinkler system, Information Technology Director Steve Whittekiend said. The Fire Department checked the council chambers with their heat cameras, and when everything checked out, they allowed city personnel to enter the room. “When we got the ‘all clear,’ we came in and saw the sprinklers (had gone off) and tried to save IT equipment,” Whittekiend said. Water to the fire suppression system was shut off. Power to City Hall was also shutoff due to water getting into the electrical systems. Phone systems in the building were also shut down, which affected City Hall, as well as the Washington County Community Center and the city’s public works building. Most of the flooding was localized to the council chambers and the basement, Whittekiend said. The building’s server room and records storage are located in the basement. While damage is light, he said, it’s likely they lost IT equipment that was directly hit by the water. A restoration crew arrived on the scene to deal with the water damage between 4 and 5 p.m.
City Council members and residents began to appear at City Hall for the 6 p.m. City Council meeting. 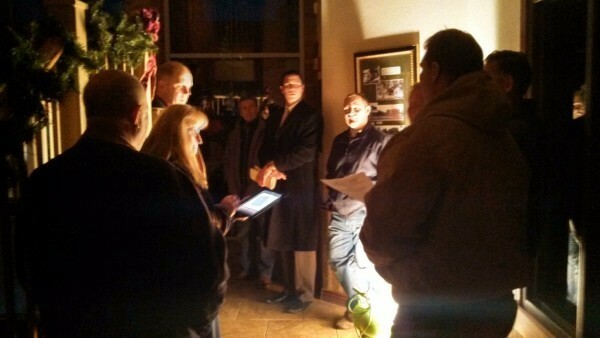 While the council members and attendees stood in the City Hall’s lobby, dimly lit by temporary lighting, Councilman Jeff Turek, acting as mayor pro-tem, made a motion to approve the meeting’s agenda, followed by a prompt tabling of the agenda until the next meeting. The motion passed, moving the next council meeting to Dec. 19. After that, people began to exit the darkened building. “This is by far the weirdest council meeting I’ve ever been to,” Councilman Bill Hudson said. Washington City will announce when services have been restored to the building via its Washington City Utah Power Facebook page. It has yet to be determined if the cause of the sprinkler head bursting was due to faulty equipment or a frozen line. Our home flooded as well because of the sprinklers bursting. Fun day.